Synergies between different muscle groups underlie the organization of complex action. Even in simple tasks such as pointing Gerald L. Gottlieb and colleagues (Boston University) have shown the presence of marked linear synergies (covariance) between elbow and shoulder torque. 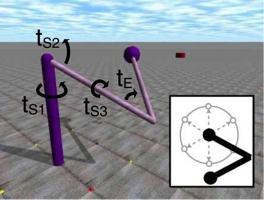 In model developed by Marieke Rohde, we used a 3D arm model in a realistic physical simulation to test the role of synergies using different evolved neurocontrollers. Even though synergies are not observed to evolve by themselves, imposing linear synergy leads to better and faster solutions. The model has lent support to further work by original research team. Rohde, M. and Di Paolo, E. A., (2005). t for two. Linear synergy advances the evolution of directional pointing behaviour. Advances in Artificial Life, Proceedings ECAL 2005, 8th European Conference, Canterbury UK, M. S. Capcarrere et al. (eds), Springer, Berlin Heidelberg, LNAI 3630, pp 262-271. 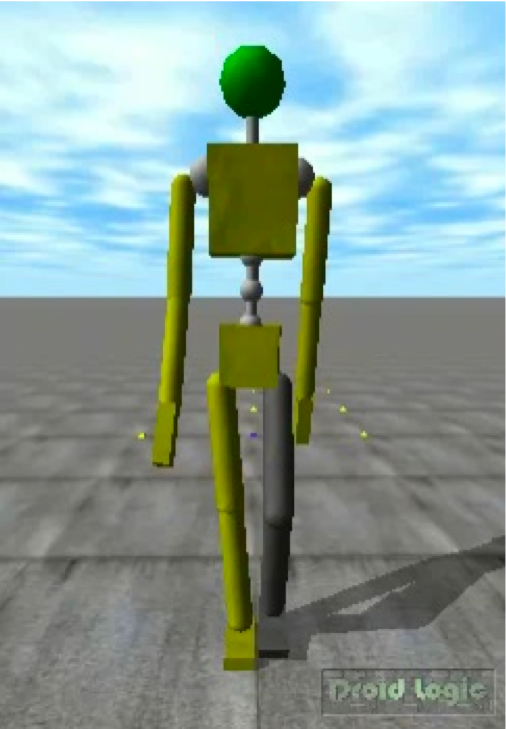 Using an incremental evolutionary approach, it is possible to evolve bipedal walkers that make full use of the passive dynamic properties of their bodies and require a combination of simple reflex neural circuits in order to walk over rough terrains and sustain a variety of perturbations. The resulting humanoid robot developed by Eric Vaughan at Sussex (left) has 33 degrees of freedom: 2 in each ankle, 1 in each knee, 3 in each hip, 9 in the spine, 3 in each shoulder, 1 in each elbow, and 2 in each wrist. It can walk indefinitely in any direction on smooth and rugged surfaces at different speeds. Vaughan, E., Di Paolo, E. A. and Harvey, I., (2004). The tango of a load balancing biped. 7th International Conference on Climbing and Walking Robots, CLAWAR 2004Madrid, September 22th-24th, 2004. Vaughan, E., Di Paolo, E. A. and Harvey, I., (2004). The evolution of control and adaptation in a 3D powered passive dynamic walker. Proceedings of the Ninth International Conference on the Simulation and Synthesis of Living Systems, ALIFE’9 Boston, September 12th-15th, 2004. MIT Press. Harvey, I., Vaughan, E., and Di Paolo, E. A., (2004). Time and Motion Studies: The Dynamics of Cognition, Computation and Humanoid Walking . In HART 2004, Fourth International Symposium on Human and Artificial Intelligence Systems: From Control to Autonomy. December 5-6, 2004, University of Fukui, Fukui, Japan. While there is a trend in current robotics towards more biologically inspired actuators, most work emphasizes the elastic property of muscles and tendons. Although elasticity plays a major role in many forms of movements, particularly walking and running, other features of animal muscles might also affect or even dominate movement dynamics. 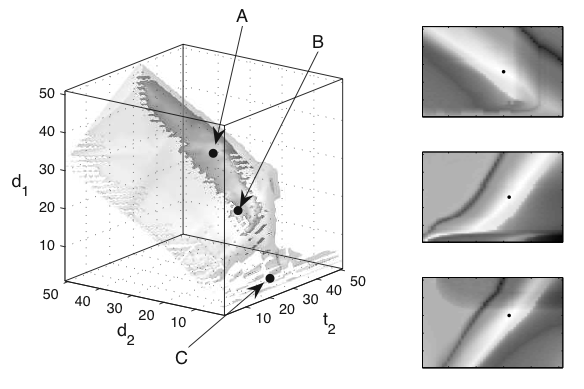 In a study in collaboration with Thomas Buhrmann, we have used the Hill-type muscle model, common in biomechanics, to investigate the relationship between muscle dynamics and control signals in simple goal-directed movements. 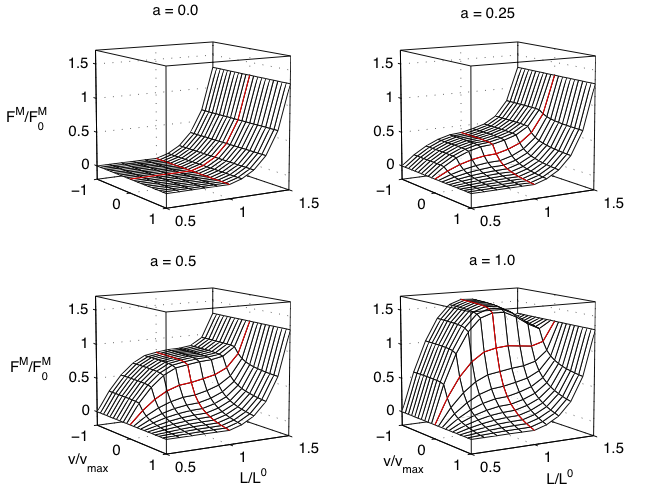 We have found that the various non-linearities of the model (activation-depende profiles shown in bottom left) lead (unexpectedly) to desirable properties with regard to controllability, such as increased stability and robustness to noise, independence of position and stiffness, or near linearity in search space (shown bottom right). We conclude that in our attempt to create robots exhibiting the same flexibility and robustness as animals we have to seek a balance between the complexity of actuators and the extent to which their natural dynamics can be exploited in a given task. Buehrmann, T., and Di Paolo, E. A., (2006). Biological actuators are not just springs: Investigating muscle dynamics and control signals. From Animats to Animals 9 The Ninth International Conference on the Simulation of Adaptive Behavior (SAB’06) 25 – 29 September 2006, CNR, Roma, Italy , S. Nolfi et al. (eds), Springer, Berlin Heidelberg, LNAI 4095, pp 89-100. Jakob Von Uexküll explained purposeful animal behaviour by joining an organism’s phenomenal world (the world as perceived) and its effector world (the world as enacted) into a single closed whole, the Umwelt. The Umwelt as defined by von Uexküll consists of a set of functional circles. 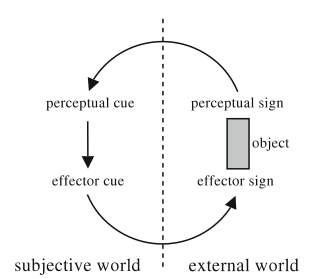 These are abstract structures that tie together a subjective experience or perception (termed a perceptual cue) and the effect that the perceptual cue has on the behavior of the organism (called a effector cue). This idea can have practical implications for evolutionary robotics when the morphology of the robot is evolved. Straightforward additions to the evolutionary method (such as evolvable sensorimotor offsets) improve evolvability by facilitating functional links between neural and body dynamics. We have explored these ideas together with Ian Macinnes. Macinnes, I., and Di Paolo, E. A., (2006). The advantages of evolving perceptual cues. Adaptive Behavior14(2), 147 – 156.